Qualifying patients for treatment can be a challenge. Premature promises that a patient should be a candidate and last minute discovery that, for whatever reasons, she is not a candidate can often cause unnecessary disappointment/disruption in patients’ schedules. It is not unusual to learn that occasionally patients get tears in their eyes when they hear the news. 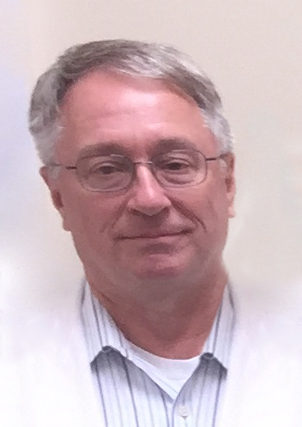 We have learned that John Cantrell, M.D. the radiation oncologist and Medical Director at Baptist Memorial Hospital in Oxford, Mississippi had a string of success – in fact, a perfect record – in identifying appropriate patients. During the launch of AccuBoost, Dr. Cantrell relied entirely on the preoperative wire localization mammograms of the patients. Even though the contribution of wire localization images had been considered in the past, this is the first time to our knowledge that the art has, seemingly, been reduced to a scien ce. Q: How did you decide on using wire localization for prescreening patients for AccuBoost? 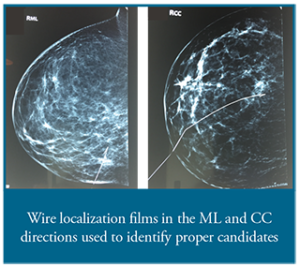 A: Our surgical oncology colleagues rely on wire localization mammograms for surgery. It occurred to me that a radiation oncologist using the same image sets should be able to identify canidates free from the uncertainties inherent in screening by CT.
Q: How confident can you be in pre-qualifying the patient? A: As a cautionary step – just to be on the safe side – I rely on the wire localization mammograms to screen out patients with tumors too close to the chest wall. Q: Are there any clues/lessons that you can share with others? A: I find it beneficial to look at both sets of orthogonal images. The mammograms are displayed next to post-operative images taken in the same orientation. Oftentimes, it is easy to identify and line up anatomical landmarks and use them as guides to pinpoint the tissue around the tumor bed that is the target for radiation dose. Q: Do you find the pathology reports helpful in targeting the dose? A: In principle, the pathology report should guide the radiation oncologist to preferentially treat the microscopic residual disease. This clearly suggests that the boost dose should be targeted to the closest (negative) margin. If the pathology report indicates that the closest margin is, for instance, lateral, preferentially the boost dose should be targeted to cover the tissue near the closest margin in effect relying on disease-guided targeting.